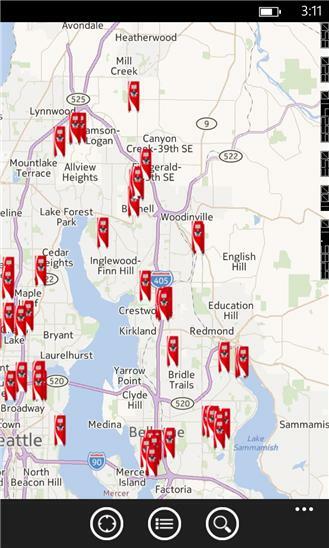 The Coca-Cola Freestyle app helps you find the nearest location where you can select from 100+ drink choices. The latest version also allows you to connect your Windows Phone directly to the Coca-Cola Freestyle machine to pour mixes or unlock Share a Coke drink discounts. Key features of the app include: Location Finder – search by address, city, state, zip, or country for a Coca-Cola Freestyle near you. Don’t have one? No problem! Request one in the app. 100+ Choices – browse over 100 drink choices available on Coca-Cola Freestyle, with over 70 low/no cal choices and dozens you can’t find anywhere else. Mixes – How does 50% Fanta Lime, 25% Fanta Raspberry, and 25% Coca-Cola sound? Create your own drink recipe by combining 2 or 3 drinks and setting the % mix. 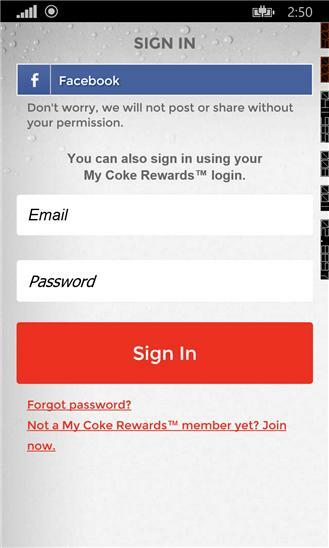 If you sign in via Facebook Connect or My Coke Rewards we’ll store your recipes and have them ready to POUR on a Coca-Cola Freestyle machine. In app authentication is required to POUR drinks on a Coca-Cola Freestyle machine. Social - share your mix in social media for friends and family to try. Don’t worry, the Coca-Cola Freestyle app won’t post anything to your wall or access your friends/contacts. You have full control on what is shared. Favs – Having over 100+ choices is cool, but everyone has their favorites. Right? Go ahead and select your Favs… we’ve got some surprises ready when you save your Favs. Connect to Coca-Cola Freestyle – the built in QR reader is available to scan the Coca-Cola Freestyle UI screen. Just scan and watch the fountain machine screen change before your eyes. Scanning the QR code also checks you into the location, which may qualify you for a special offer or badge. Offers & Push Notifications – This app uses location services to send discounts and special offers when in proximity to a participating restaurant, movie theatre, or theme park. Users can opt out of this feature in the OS and/or within the app. Share a Coke – from July 1 – Aug 30th you will receive a coupon to share with a friend for $1 off a 20oz Coca-Cola. Coupon is delivered to your phone after you pour any Coke, Diet Coke, Caffeine Free Diet Coke, or Coke Zero variety from Coca-Cola Freestyle. Just use this app to connect to Coca-Cola Freestyle and Share a Coke with your friend! See official program rules in the app. • Improved Map Features – store locations update in real-time as you browse the map • Stability Improvements – bug fixes.